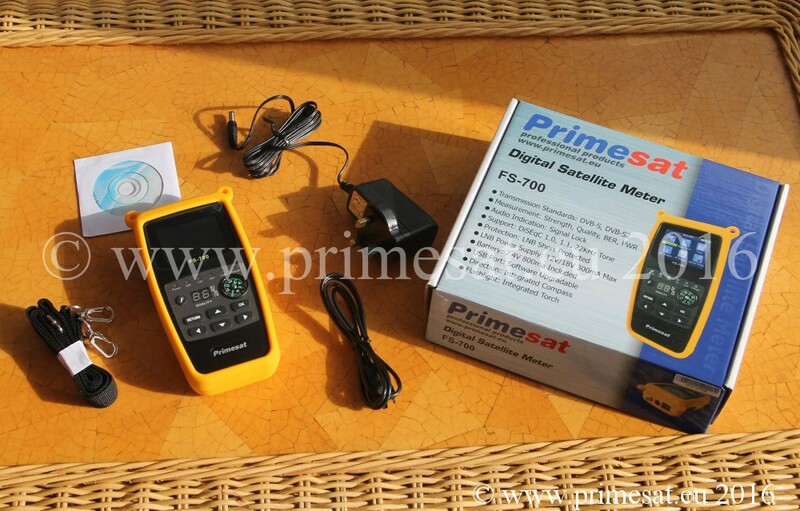 Satellite finder meters, Primesat DVBs2 satellite meters. 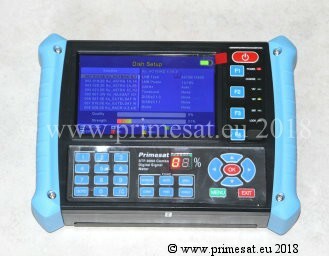 Primesat PR8000, SF700, SF500, STF9000, professional satellite meters. 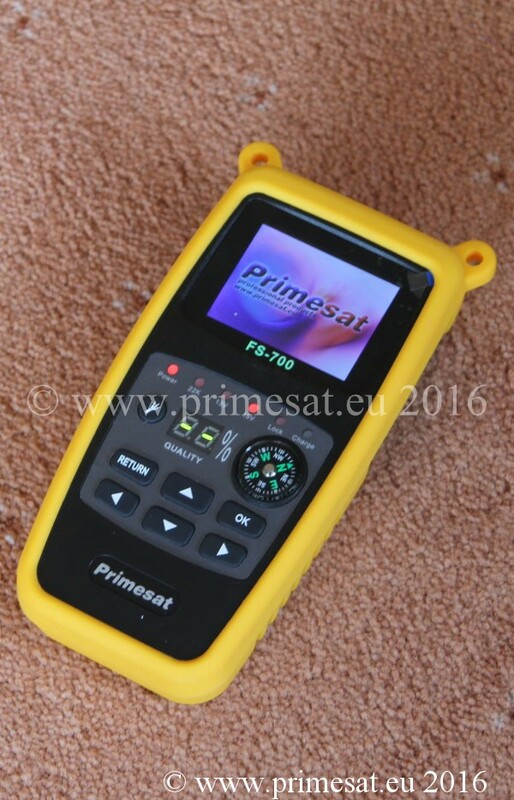 Primesat SF-700 DVB-s2 professional satellite meter. This meter is ideal for installers, mobile caravan use or DIY. Since it identifies the satellite, set up time is usually under two minutes. Please don't mix this meter up with others you may find on the Internet which look similar. This has been specially prepared for the UK and Europe. 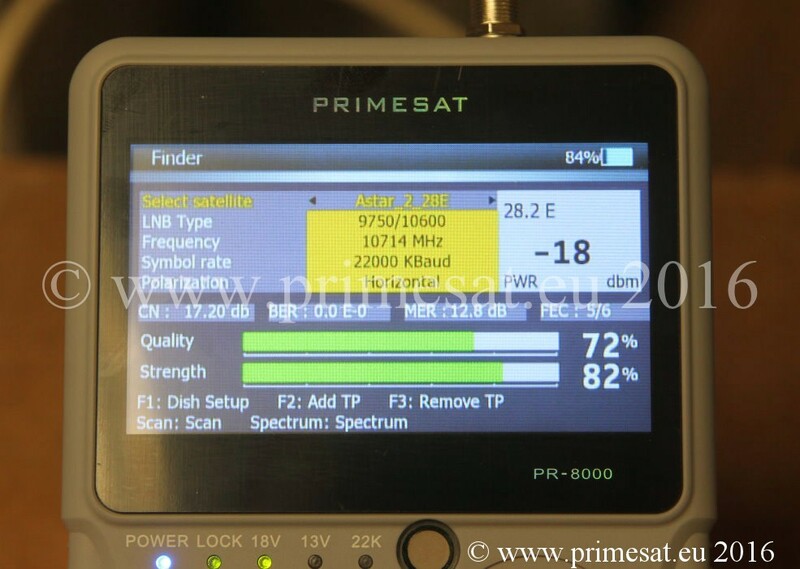 This meter has date installed for many satellites including Astra 2 for Sky or freesat, Astra 1, Hotbird (13E), Thor (1W), Hispasat (30W) and many others. Indeed all of the satellites we can see in our sky with a reasonable sized dish are included. 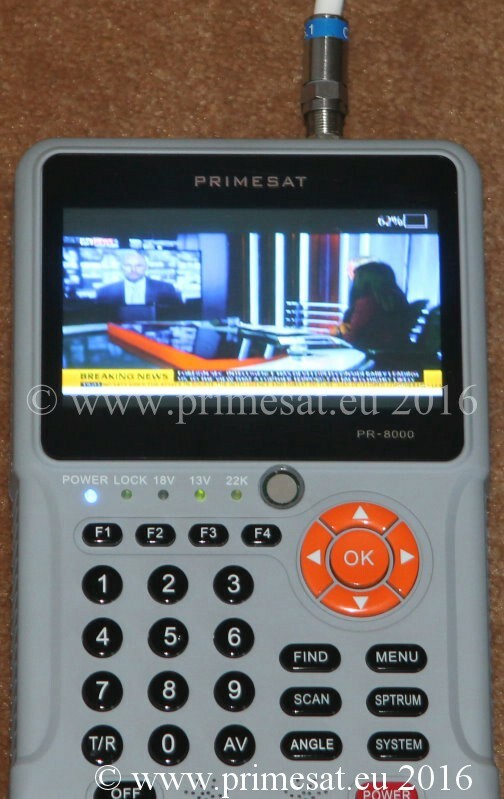 If there are changes in the future, satellites can be added or edited using the keypad. To use the meter, you switch on using a proper on-off switch (so no battery drain while off) then select "Sat Setting", then "Sat Name" and "OK". Select 28.2E Astra 2. At the bottom of the screen are the signal strength and signal quality bar graph meters and a large quality LED display on the meter all ready to start. It could not be easier. After the first use, the meter defaults to the last satellite chosen and so if it is only going to be used for (e.g.) 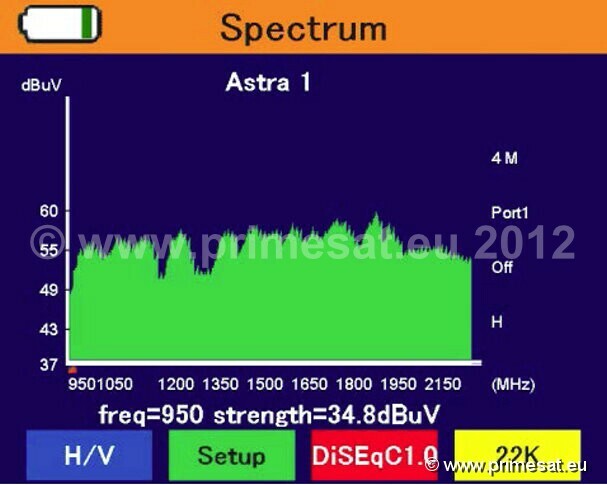 Astra 2 for Sky or freesat, selecting the satellite is not required as it is already there. All you have to do is turn on the meter, press OK twice and it is ready to use. This meter is at a very competitive price. 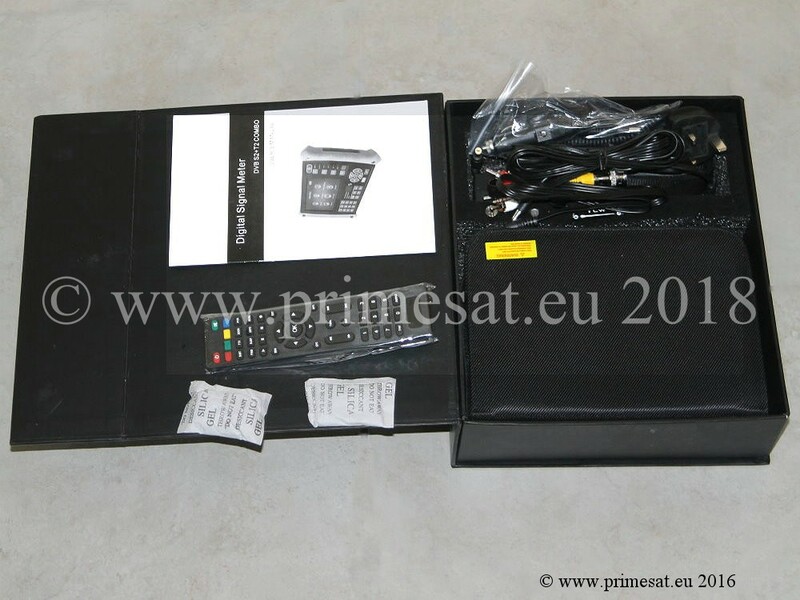 Features - DVB-S and DVB-S2 (SD and HD). Strength, quality, BER and PWR. Audio indication of signal lock. Supports DiSEqC 1.0 and 1.1 and 22KHz tone. LNB short circuit protected. UK power supply / charger 12/18V 300mA. 7.5V 800mA battery. Shock protecting yellow cover. USB port - software upgradeable. Integrated compass, Integrated torch. Cary strap and USB lead included. 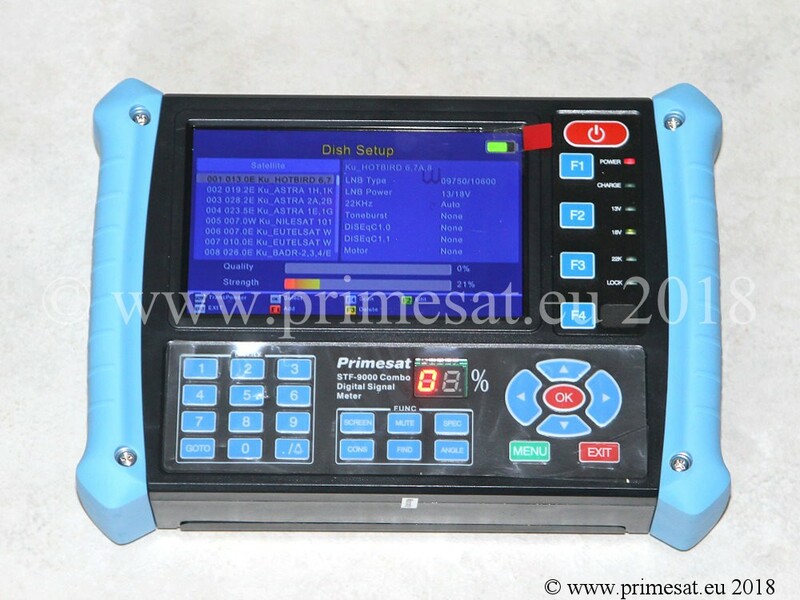 Primesat PR-8000 HD professional DVB-s2 satellite meter. 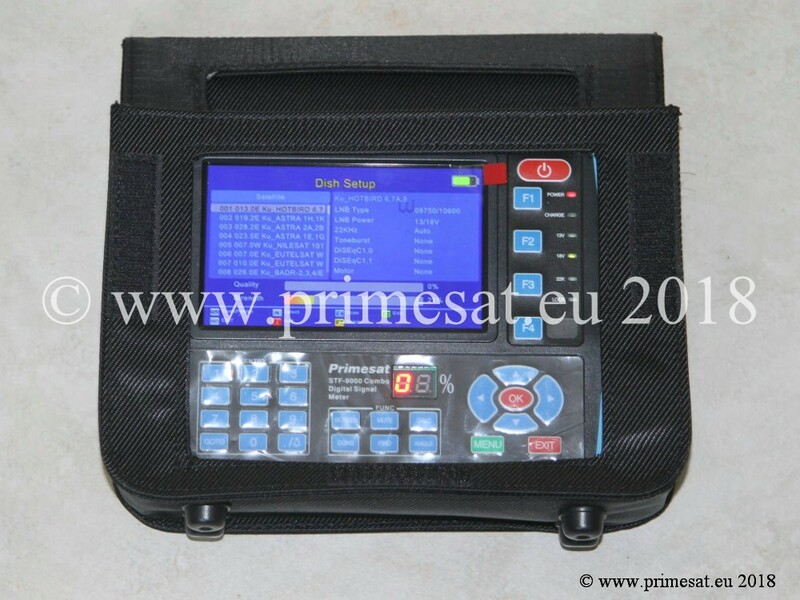 Primesat STF9000 satellite terrestrial combo meter. 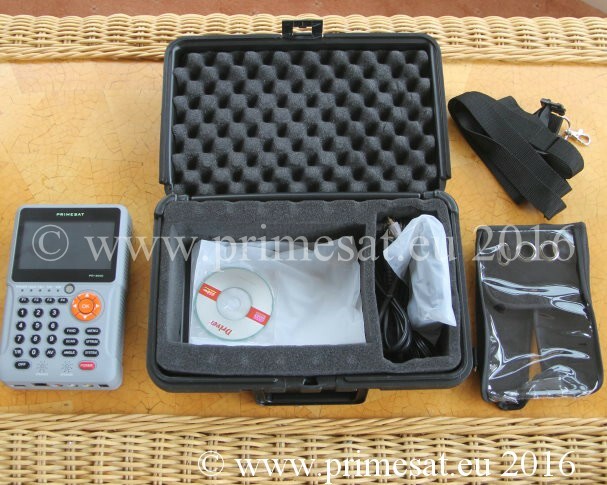 This is our top of the range combo satellite and terrestrial meter. 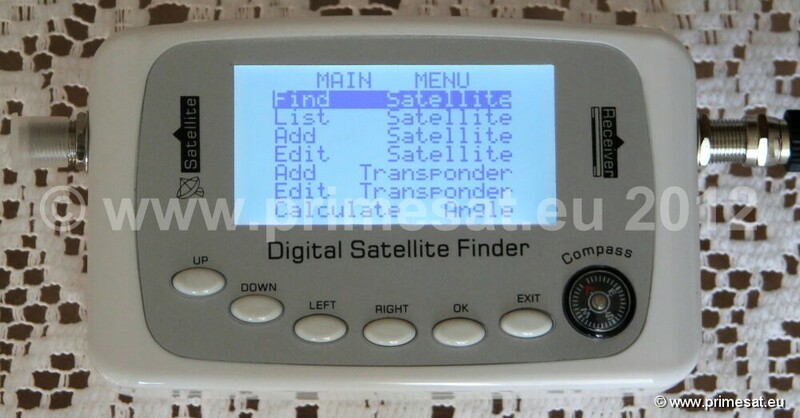 Find the satellite or antenna quickly with easy to use menus. 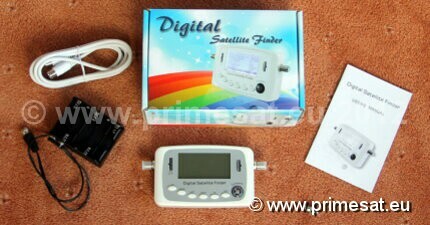 Built in TV screen and spectrum analyser. This meter comes with many accessories. Strong canvas case and carry strap. S2 - Frequency range 950MHz - 2150MHz, Impedance 75 ohms, Demodulation QPSK, 8PSK, Symbol rate 2-45Msps, 22KHz supported, DiSEqC 1.0/1.1/1.2 supported. T2 - Frequency range 170-230MHz (VHF) and 470-862MHz (UHF), Impedance 75 ohms, Demodulation type OFDM fully compliant with DVB-T2 standard, Bandwidth 6MHz, 7MHz, 8MHz. Low cost professional meter. 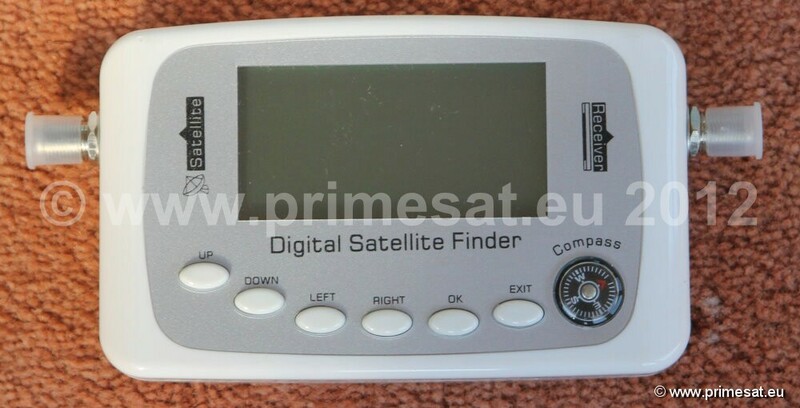 Identifies satellites.This meter is ideal for DIY, mobile caravan use or installers. Since it identifies the satellite, set up time is usually under 2 minutes. Please don't mix this meter up with others you may find on the Internet which look similar. These meters are specially built and prepared for the Satellite Superstore and they have our own prescribed dataset installed at the factory. We wanted the meters to be simple to use but also have some useful options. For that reason 3 satellites are provided. 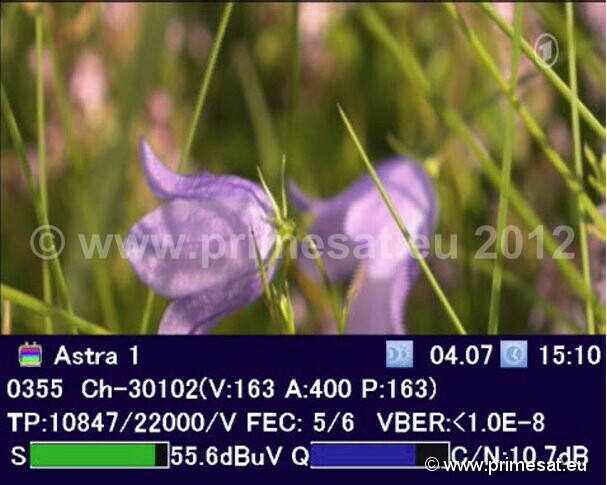 Astra 2 at 28E for the English channels from freesat or Sky, Astra 1 at 19E and Hotbird at 13E. If you are in a caravan and touring a long way from the UK, Astra 2 may be difficult to find and may need a dish too large to carry. With this meter you can switch to Astra 1 or Hotbird and still find some useful channels including "BBC World". To put more than 3 satellites into the meter would have made it more complicated and not so quick and easy to use. 3 satellites seemed like the best balance for the budget / quality meter market. Note - other satellites can be added manually using the buttons on the meter if required. (Similar looking meters found on the internet are usually full of Chinese satellites and may not have been pre-prepared. Or if they have, Astra 2 may be mixed up with all of the many Chinese satellites and that can be confusing. The unwanted satellites cannot be deleted.) There are none of those problems with the Primesat meter. Also note, very cheap meters which do not ID the satellites can take much longer to use and whilst they may be OK for a one off installation, they are not recommended for regular use. Note - a battery holder power pack and a mains power supply are also included. It is unusual to find this meter with a mains power supply but this useful addition means that if you have no batteries or they are running low on charge, you can power the meter from the mains. Both of these options are better than trying to run it from a satellite receiver's LNB cable as modern low energy receivers (especially Sky receivers) often do not provide enough current to properly power up larger meters. This is an ideal meter for finding the satellite quickly at an excellent and very competitive price. 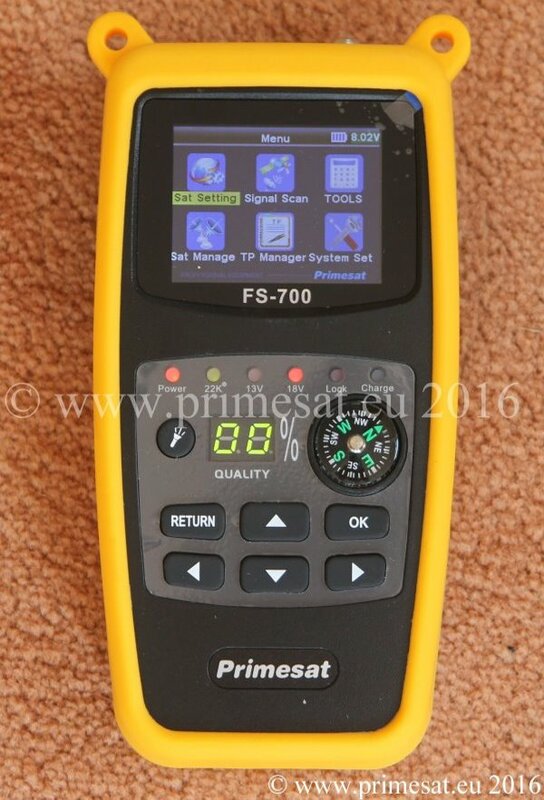 See some useful options below including "fly leads" and adding satellites to this meter. 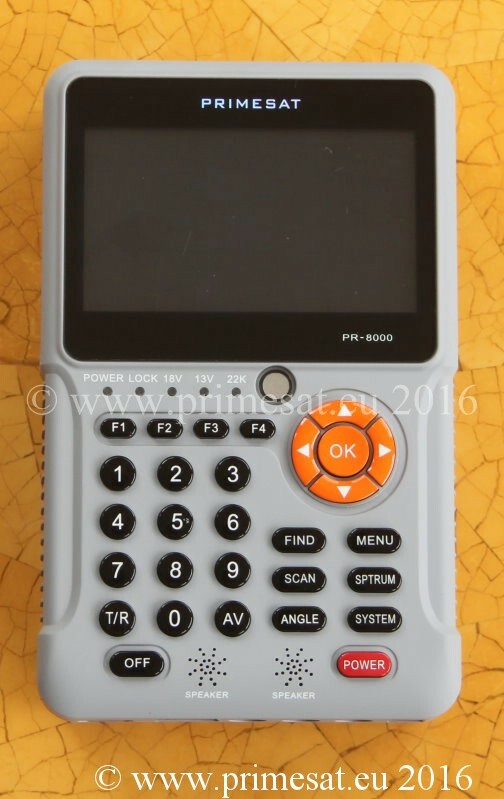 We also sell a similar meter, the SF600, with a built in re-chargeable battery. Select smaller images & hover over larger image to view in higher detail. Select small images below & hover over larger image to view in higher detail.